After entering owner and chef Pacaud greats you with no fuss, with his modesty, shyness, and, if you look him in the eyes, a bit of sadness, but still filled with a glimpse of sparkle. Now, at 71, he is again more in the kitchen and is still driven by his quest to perfect intensity as Julot has so nicely put it. Only recently, Gastromondiale (yes, the successor of the legendary Gastroville founded by Vedat Milor and Mikael Johnson, now the acclaimed chef of Hedone) has published even two accounts or portraits of Pacaud – they call the restaurant the “purest surveyor of the Golden Age” and Pacaud in the second ‘tribute’ “the last of the Mohicans”. As my culinary experience does not reach back to the Golden Age (70s, 80s and most of the 90s of French Fine Dining), I cannot really comment – judging from now, the atmosphere in the restaurant itself, the decor, the service, is timeless and not dusty at all. Especially the service is professional, reserved but very appreciative of dialogue and interaction even if you not a regular. Just show curiosity and respect and you will have a nice experience. Embrace, indulge, enjoy! Then, there is Pacaud’s cooking. 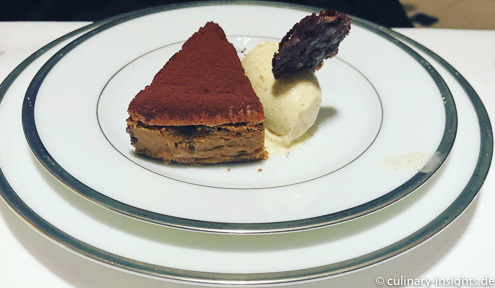 Clearly, it is polarizing – my friend Steve Plotnicki doesn’t like it as he thinks it is stuck in the age of Nouvelle Cuisine and rescues innovation. But, in my humble opinion (being an advocate of modern and avantgarde cooking myself), there is a place for classic cuisine if it simply uses the best products, apply technical mastery and perfect dishes over the years. It is a razor-thin line because the slightest mistake, the slightest flaw makes these cooking boring if the the level of perfection is not achieved. Moreover, the restaurant for me is a benchmark of the best products available. So, being a serious foodie, one has to have eaten here – to experience this level of quality and then being able to judge from here. Clearly, in the age of globalization, good produce can be sourced anywhere anytime but some products just do not leave France. I can still remember the taste of any of my dishes at this restaurant or the perfect seared foie gras I had at Maison Pic in 2009. Let us start with one of the iconic dishes of this restaurant, the feuillantine de langoustines aux graines de sésame, sauce au curry. It is simply a masterpiece: first, there are the best langoustines I ever had, one of those rare species that are nothing but the best. So fresh, you can still taste the sea, so perfect in taste with its intrinsic fleshy, slightly nutty and iodic character. In contrast to many many other examples, you can roast them almost thoroughly (and not just get it touched by some heat and serving essentially rare product because otherwise it gets chewy) resulting in an elevated product having much more character and backbone, elaborating on the nuttiness to provide a better counterpart in the context of the dish. There are three langoustines for the full portion (105€), exactly the same size (and 1.5 for the half portion), there is the best sautéed spinach, masterfully thin sesame crackers to add crunch and replicate and fortify the nuttiness and a sauce that is so seemingly simple that makes it so difficult. The interplay is astonishing, as if this accord has to just be that way, as if this is the most natural way of presenting the character of these fine langoustine. There is constant standing ovations in your head while you eat that. Simply brilliant! 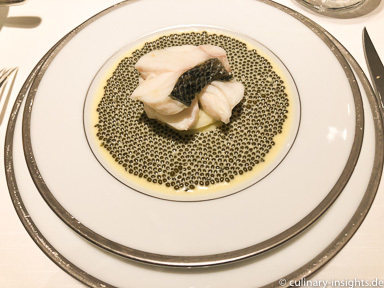 The second iconic dish are the escalopines de bar à l’émincé d’artichaut, nage réduite au caviar golden (full portion 160€, half 100€). Needless to say, the loup de mer is perfect, also in preparation whereas the cooking time is again longer than traditionally. But again, it works and adds extra plasticity to the fish. Then, this sauce – it is light and so delicious with a generous amount of caviar that plays so nicely with artichoke slices that are lightly flavored with lemon and have just the right texture. One of a kind! 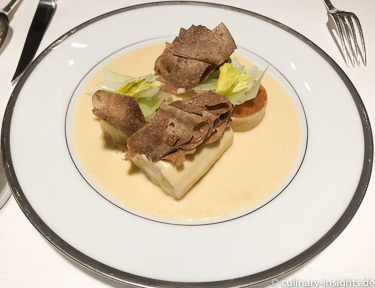 Sole was next – Dos de sole braisé à l’effeuillée de choux de Bruxelles, drapé de truffe (150€). Again a benchmark product, prepared as a double-filet with cabbage and lots of truffles (there is no weighting;)). Again, very memorable. Main course – sweetbread: noix de ris de veau braisée à la citronnelle, ravioles au gingembre (142€). 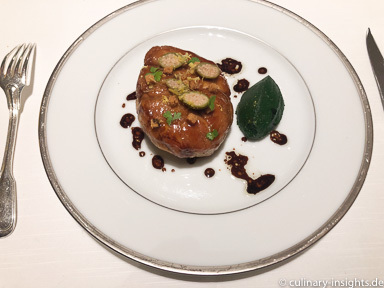 Since I had the immense pleasure in having the sweetbread at Le Pont de Brent when Gérard Rabaey excelled at this very product I never had one of the same perfection (maybe except Christian Bau’s heart sweetbread). Very often it is disguised by flour coating (mostly too thick) and then fried. Pacaud’s version is simply pan-roasted (in order to do that it has to be of the best consistency), flavored with capers and lemon, some parsley puree is a dip and ginger ravioli (not pictured) at the side to lighted things up a bit. There is this very balance wof sweetness and acidity that only great masters achieve. Pacaud does so, in his very own reduced and faced way. Nothing to add and nothing to leave out. Perfection! Don’ miss the cheese board (45€, we shared one serving) yielding some of the best cheeses I have ever tasted. I didn’t ask for the affinieur because that didn’t seem important to me in this very moment of pleasure. Last but not least, leave some room for the chocolate tarte (35€, pictured is a half portion), the best on the planet. It is so light and aery, made without eggs, using the best chocolate only made for Pacaud – paired with simple but intense vanilla ice cream. A perfect end to a perfect meal. If there would be one wish: please make this restaurant never go away. Every chef, every foodie has to eat here at least once in his/her life. It is the benchmark in classic cooking, never boring, always somehow update. 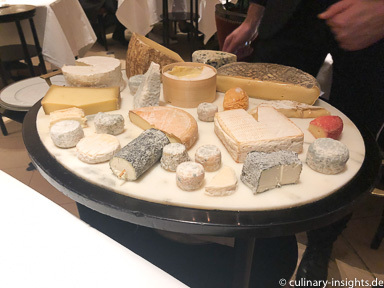 It is utterly expensive (also the wine list), there is no tasting menu but you can always discuss splitting portions to be able to indulge in one more dish. It’s not for every day (although for many regulars it is), it’s for special moments that make life worth living! Enjoy! This entry was posted in Allgemein, L'Ambrosie and tagged Bernhard Pacaud, Classic cusines, Michelin, paris, Three Star Michelin by IFS. Bookmark the permalink.